This is more evidence of the Tories’ obsession with turning Britain into ‘America junior’. On Sunday Mike over at Vox Political put up a piece about the current chancellor, Philip Hammond’s interview with the German newspaper, Welt am Sonntag, in which he said that if Britain could not gain access to European markets after Brexit, it would allow the country to turn away from the European political and economic model. Instead of following the ‘European-style’ social model, with high taxation and regulation, Britain would become ‘something different’. Mike called this Tory stupidity and arrogance at its worst, and he’s right. Britain cannot win a trade war with Europe. Europe constitutes more than half of the market for Britain’s exports. And every time Theresa May opens her trap about Brexit, investors take fright and the pound plummets to a new level. Mike’s article quotes Jeremy Corbyn as saying that he expected the majority of MPs to be worried about Hammond’s ideas. And he’s right. Mike predicts that Hammond’s idea would result in massive unemployment, as exclusion from the European market means that demands for our products would fall. Furthermore, the low taxation Hammond so glowingly looks forward to would mean that the state would receive less. Mike doesn’t point out what that means, but it’s fairly obvious: state expenditure would immediately slashed, meaning even more welfare cuts, the further rationing and privatisation of the NHS and the education system. Of course, this is precisely what the Tories have wanted ever since Thatcher. 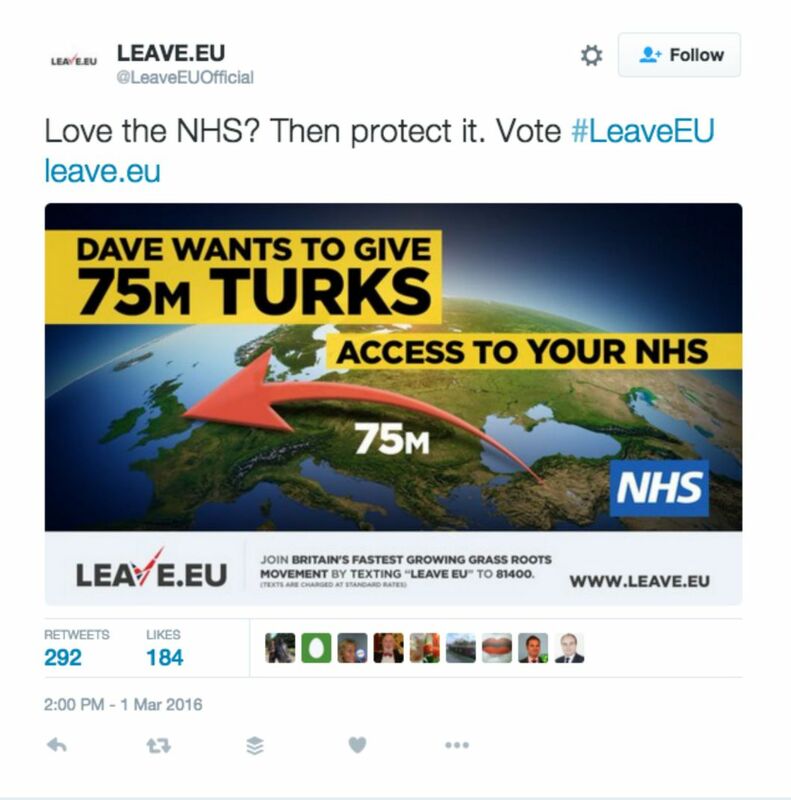 They want to make Britain more like the USA, with its private healthcare system and minimal welfare provision. It’s an economy which has traditionally been based on low taxes, although under Bush the people of America actually started paying nearly the same amount in tax as the people in this country because of the vast military expenditure. At least, that’s what I was told by American friends. However, Bush made a series of tax cuts, followed by Obama with more promised by Trump, which will deprive the poor of even further employment protection and welfare benefits in favour of massive tax cuts for the rich. Just like Cameron and May have done and are doing for the Tories. Hammond’s moronic idea is not original either. It’s just a continuation of Cameron’s attempts to stop the EU extending its financial regulations over Britain, so that London could become the centre of the global fraud that constitutes offshore banking. It also shows the absolute ignorance and contempt of Thatcherite economists for the manufacturing industry. Thatcher’s cabinet was dominated by people from the financial sector, as was Blair’s, Broon’s, and, I assume, Cameron’s and May’s. There was one cabinet member, whose background was in manufacturing, who tried to point out to Thatcher that her pursuit of a strong pound would harm British manufacturing industry, as it would make our products more expensive than our foreign competitors. But she couldn’t understand this basic economic fact. As for Tony Blair, he rejected the manufacturing sector, as it was economic dogma during his tenure of No. 10 that the financial sector would become the major industry in the UK. We were supposed to be a ‘post-industrial economy’. Deanne Julius, one of the experts at the Bank of England, and a former officer with one of the big American banks, actually said that we should give up manufacturing and concentrate on the service sector. Manufacturing industry, she believed, should be left to the Americans. Ha-Joon Chang has pointed out in his books how wrong this attitude is. Britain is still very dependent on its manufacturing industries. These are less significant than they were, because they have not grown as much as the financial and service sectors, but are still very important parts of our economy. If this part of our economy contracts even further, it will be disastrous for the British economy as a whole. Not that you will hear that from the Blairites or the Tories. New Labour was very keen not to be seen as the party of high state regulation. During the ‘prawn cocktail offensive’ in the late ’80s, Broon and Mo Mowlam went round the City reassuring the bankers that New Labour would adopt a ‘light touch’ attitude to regulating the financial sector. And we can all see how well that paid off, with the great financial crash of 2008. We’re still paying for that. Not the bankers, not the big industrialists, but the ordinary people of Britain, who are seeing are tax bills go up, our welfare benefits and employment rights taken away, and the NHS sold off to private contractors, all to give the 1 per cent even more tax breaks. And last Sunday, Philip Hammond told the German press he wanted more of the same, but much worse. This shows his and May’s attitude to Britain’s working people. They are to be forced into even more precarity, with fewer opportunities for employment and massive poverty. Because Hammond wants to make his bankster friends in the City even richer. And defend the NHS. May and Hunt should resign. Now. This is disgusting. Cluster bombs are an horrific weapon, and its with very good reason that they’re banned under international law. However, I have absolutely no difficulty in believing that these were made over here. Indeed, they may well have been part of that ‘wonderful kit’ Cameron was praising to the skies when he visited that armaments factory in the north of England to promote British exports. Over the years Private Eye has exposed case after case of the British aerospace and armaments industries – mostly BAE – producing weapons banned under international law, like electrified riot shields. Despite the Eye’s best efforts here, I don’t doubt that they’re still being produced somewhere, and exported to the Gulf. Cameron was, like Blair and Thatcher and Major before him, very keen at promoting British arms sales, particularly to Saudi Arabia and other nations with a history of brutally suppressing any dissent. In the case of Saudi Arabia, 70 per cent of the Yemenis killed by them are civilians, and the Saudis are actively targeting them in schools, mosques, hospitals and factories. If this report is correct, we have absolutely no business helping this brutal regime kill more innocents with illegal weapons. 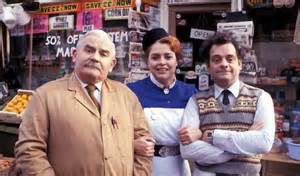 Arkwright, Granville and Nurse Gladys Emmanuel from Open All Hours: The face of the British s-s-s-small businessman, who should benefit from a proper investment bank for their needs. Mike over at Vox Political has today published this article, Labour’s bank reform plans, including bonus clawback and a British Investment Bank, announcing that Ed Balls and Labour’s Shadow Financial Secretary to the Treasury, Cathy Jamieson, will today announce the Labour Party’s plans to reform the banking industry. The new legislation will extend the amount of time in which the government can confiscate banker’s bonuses in the cases where they’ve broken the law. They also want to increase the levy on payday lenders to support alternative sources of credit and increase competition between banks. They also want to set up an investment bank, which will support investment in small and middle-sized businesses. Labour is today (Friday) publishing its plans to reform the banking sector so that it better supports growing businesses, economic growth and rising living standards. Ed Balls MP, Labour’s Shadow Chancellor, and Cathy Jamieson, Labour’s Shadow Financial Secretary to the Treasury, will publish Labour’s banking reform paper after a visit to a business in Bedford. · Extending clawback of bank bonuses that have already been paid in cases of inappropriate behaviour to at least 10 years and enacting legislation, passed by the last Labour government, to require banks to publish the number of employees earning more than £1 million. · Creating a proper British Investment Bank to provide vital funding for small and medium-sized businesses. All funds raised from the planned increase in the licence fees for the mobile phone spectrum – estimated to be up to £1 billion in the next Parliament, subject to Ofcom consultation – will be allocated to the British Investment Bank. · Introducing a one-off tax on bankers’ bonuses to help pay for Labour’s Compulsory Jobs Guarantee – a paid starter job for all young people out of work for 12 months or more, which people will have to take up or lose their benefits. · Addressing the lack of competition in the sector. We welcome the Competition and Markets Authority inquiry which we called for and want to see at least two new challenger banks and a market share test to ensure the market stays competitive for the long term. · Extending the levy on the profits of payday lenders to raise funding for alternative credit providers. Mike quotes Ed Balls as recognising the importance of the banking industry to this country, but states that it needs to be better regulated in order to encourage and promote economic growth. “Banks are essential to our economy, but we need them to work better for the businesses and working people who rely on them. The article’s at http://voxpoliticalonline.com/2015/02/13/labours-bank-reform-plans-including-bonus-clawback-and-a-british-investment-bank/. Go over there and read it. Mike wants to hear what his readers think. I have some problems with it, but I think in broad terms it is very much a step forward. It also marks a strong break with New Labour policies. Mike’s been arguing over on his blog that Ed Miliband is not the same as Tony Blair and Gordon Brown, whose time is long past. This provides further proof. Despite the rubbish that Cameron and the Tories have spewed about the banking collapse being due to over-regulation by Labour, the very opposite was true. New labour was strongly opposed to regulating the financial sector. Indeed, it played a major role in the City’s change of support from the Tory’s to Labour during Gordon Brown’s and Mo Mowlam’s ‘prawn cocktail offensive’ under Tony Blair. Brown repeatedly reassured the bankers that Labour would regulate them with a light touch. The massive collapse and gaping black holes in the banking industry that led to the recession was not created by too much regulation, but by Labour not watching what the bankers were doing closely enough. The amount of money bankers have been allowed to pay themselves in bonuses while very efficiently wrecking the economy and ruining the livelihoods of everyone not a millionaire banker is nothing short of scandalous. Extending the amount of time available to confiscate bonuses in cases of illegal conduct is a good start, and should start to restore confidence in the industry. British industry has also been in desperate need of a proper investment bank for a very, very long time. The authors of Socialist Enterprise and Neil Kinnock, before he dropped Socialism in favour of the free market, recognised that the City was not geared to providing inward investment, and certainly not to manufacturing industry. The major investment banks had been set up to channel investment to Britain’s colonies during the Empire. Even after that had gone the way of ancient Rome, Assyria and Egypt, the banks still preferred to invest overseas than domestically. British domestic investment lagged far behind our competitors in Japan and Germany. The administrations of the last three decades, following Thatcher, have also been harshly indifferent, or even hostile, to the manufacturing sector. Quite apart from destroying British heavy industry in order to break the unions, Thatcher and her circle had strong links to the financial sector, and neither understood, nor were particularly interested in the needs of manufacturers. In one of their recent issues, Lobster carried a piece about a captain of industry, who did end up mixing with Thatcher and her cabinet. The particular industrialist was a staunch Tory, and so shared her views about crushing the unions and the importance of private enterprise and competition. He remarked, however, on how absolutely ignorant she and her chancellors were about basic economics. One of the obstacles for British exports was the strong pound. This particular businessman tried pointing out to Maggie that a strong pound discouraged countries from importing from Britain, as it made our goods expensive and therefore uncompetitive. Of course, Maggie didn’t want to hear about this, and pointed to Germany as a counter-example. Look at the Germans, she said. The Mark’s strong, and it hasn’t stopped people from buying German. To which the businessman tried telling her that the Mark was strong, because people were buying German goods. It was not a case of people buying German goods, because the Mark was strong. But this was too much for the Iron Lady and her sycophants and acolytes to grasp. Britain’s manufacturing factor needs to be rebuilt. Unfortunately, Balls and Jamieson’s statement doesn’t recognise this, but the establishment of a proper investment bank will be a very good start. As for increasing the levy on pay day lenders, I’d rather see them either shut down completely, or have their tariffs lowered even further, as well as promoting alternative forms of credit. Nevertheless, this is another good start. I also have objections to using money levied on the bankers to set up the compulsory employment scheme. Johnny Void has already attacked the scheme earlier this week with a piece sharply criticising Rachel Reeves. I believe he’s right. The scheme does look like another version of workfare, just slightly better in its treatment of the people forced to take it. I believe the whole welfare-to-work industry needs to be scrapped totally. Nevertheless, even with these caveats, I believe that Balls’ and Jamieson’s policies should be an excellent step forward. And a proper investment bank that provides support to the small and medium businessman should get the approval of aspiring Arkwrights up and down Britain. Even if it does come from the Socialists. Since Margaret Thatcher successive governments in Britain have pursued Neoliberal and Monetarist economic policies, which have seen the rich become immensely richer at the expense of everyone else. Thatcher decimated Britain’s manufacturing industry, and attempted to make the financial sector the dominant force in the British economy. The government thus adopted, under both the Tories and New Labour, a series of policies designed to promote the finance industry, and in particular, the City of London. These had a further effect of damaging Britain’s manufacturing industry still further by making our exports uncompetitive. The current government in particular has very strong connections to the City and its financiers. In a democratic republic, Engels continues, “wealth exercises its power indirectly, but all the more surely”, first, by means of the “direct corruption of officials” (America); Secondly, by means of an “alliance of the government and the Stock Exchange” (France and America). Cited in Lenin: Selected Works (Moscow: Progress Publishers 1968) 271. The above passage could describe government policies today, when so much of government policy is formulated to be benefit the banks and the financial sector, so that senior bankers and financiers have been co-opted as government advisors on the regulation and policies for the industry. 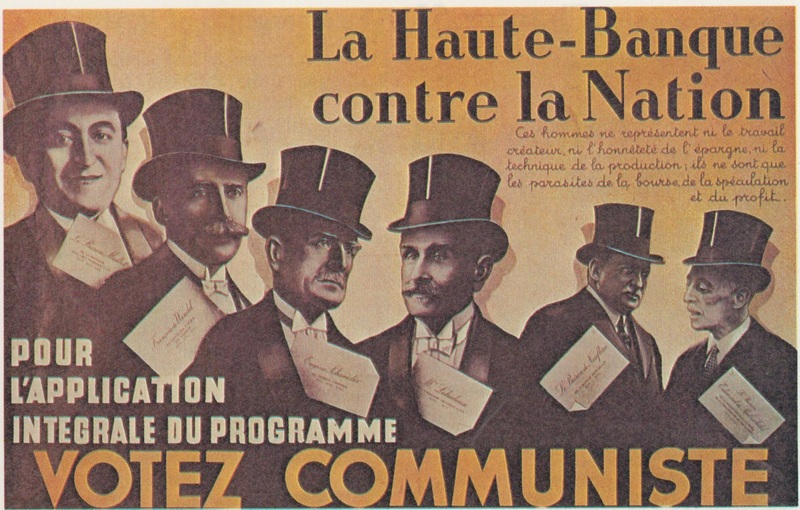 In the Great Recession caused by the 1929 Wall Street Crash, the French Communist party had no hesitation in pointing the finger at the bankers they felt were responsible for their country’s economic slump for their own profit, as the poster below shows. While clearly the financial sector is important, we do need government policies that instead once again promote manufacturing, and create properly paid jobs, rather than unemployment, instead of the current Neoliberal, Thatcherite policies that benefit only the very rich at the massive expense of the poor, the sick, disabled and elderly. 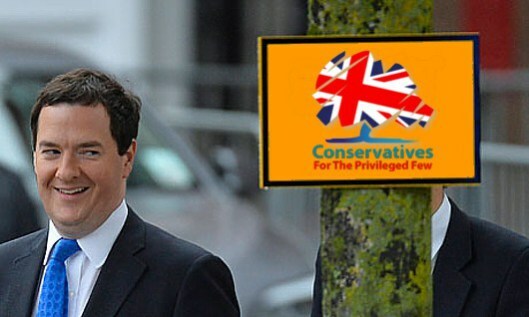 But this definitely ain’t gonna happen under Osborne. Instead, we’ll see more of the same, and a growing gap between rich and poor and consequent more poverty and despair. The sooner the Tories go, the better. Last week both David Cameron and Alex Salmond held separate meetings in Scotland with the petrochemical companies in order to discuss the vital question of the ownership and future of North Sea oil. This is a vital issue. The Scots Nationalists I’ve talked to in the past have all been of the belief that not only should an independent Scotland have a right to the oil reserves off its coast, but that this would support the newly independent nation’s economy. Although this wasn’t mentioned in the news reports, Britain faces the same question. If Britain does not retain revenues from the North Sea if Scotland leaves the UK, then the British economy will plummet. It’s a question of economic survival. I was taught at school that Britain has a ‘third-world economy’. This meant that Britain was like the various nations of the Developing World in that its economy was heavily based on primary industry. In the Developing World these industries were either mining – the extraction and production of diamonds, for example, or copper in the African Copper Belt, or the various nations around the world specialising in a particular agricultural product – groundnuts, bananas, coffee and so on. 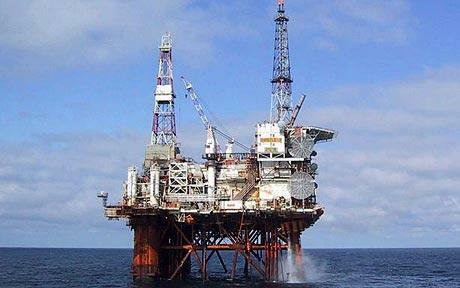 In Britain in the primary industry that fundamentally supports the country’s prosperity was North Sea oil. Under the Thatcher experiment, Britain’s underlying economic decline has continued and gathered pace. Only North Sea revenues now disguise its true extent. Without them it would be impossible to sustain the living standards which the working population currently enjoys. Britain’s present levels of employment, industrial activity and public services are all being paid for on borrowed time. (p. 20). They then survey the way the Thatcher government effectively devastated the UK economy, while Labour unfairly got the blame for economic mismanagement. It is worth emphasising how disastrous Tory economic policies have been for Britain in purely economic terms. The Tory Party has never succeeded in cultivating an image of compassion or concern for social justice: but at least, so the convention goes, it can be relied on to promote ‘sound’ economic policies and generally do the things that are in the interests of business growth. The Labour Party, by contrast, seems to have a acquired a reputation for economic mismanagement. The really remarkable achievement of the Thatcher Governments has been to find a set of policies which, while designed to make ‘economic efficiency’ the overriding objective in almost every sphere or our lives, has actually had the effect of making our economy less efficient – as well as having all the more predictable results such as a huge increase in social deprivation, inequality, injustice and division. As a result we are now in a situation where socialist economic and industrial policies offer the only serious hope not only of healing deep social divisions but also of reconstructing a viable and efficient economy. Employment levels in manufacturing, construction and the public services plummeted after 1979. The international climate worsened, it is true, following the oil price rises of that year. All the major Western countries have faced increased unemployment during this period. But in Britain’s case, government policies have played an almost uniquely important part in creating a fall in national output and an increase in unemployment. By pursuing exceptionally high interest rates as part of the attempt to reduce money supply growth and inflation, and then letting the market determine the level of the exchange rate, the Tory Government precipitated a massive crisis in the manufacturing sector in the period 1979-81 – especially among companies which were relatively dependent on export markets or which had recently expanded investment or stocks in anticipation of sales growth. Meanwhile attempts to reduce public spending and borrowing resulted in a further deflationary effect: there was a particularly severe impact on employment as capital projects and welfare services were sacrificed to pay for the escalating costs of increasing unemployment – not merely a vicious circle but an insane one. If we look at another traditional measure of economic success or failure, the balance of payments, we see a similar story. Since 1982, a surplus on manufactured goods has been replaced by large annual deficits – the first such deficits since the Industrial Revolution. Imports and import penetration have risen sharply in virtually every sector of manufacturing. These imports have, of course, been paid for out of oil revenues. But declining oil revenues will no longer be able to offset the growing manufacturing trade deficit in the late 1980s and 1990s. They then go on to consider some of the contributing causes to British industrial decline, such as the price of British goods, lack of investment in research and development, and the lack of an education workforce, some of which is now extremely dated. Nevertheless, I think the main point is still valid. Thatcher destroyed the British industrial base, and it is still only North Sea oil revenues, which is propping the economy up, despite the Tory and New Labour attempt to promote the financial sector. If Britain loses these revenues, then the British economy will collapse. My guess is that we would still be in the Developed World, but go from one of the most prosperous to one of the least. The result of this would a further massive collapse in living standards, accompanied by bitter discontent. In the Developing World, mass poverty traditionally gave rise to extremist political movements – Marxist revolutionary groups, and the various Fascist dictatorships like those of General Pinochet, Manuel Noriega et cetera ad nauseam used to contain and suppress them. The same is likely to arise in Britain. This would effectively discredit all of the main political parties, as all of them have been influenced to a greater or lesser extent by Thatcher’s legacy. But those most effected would be the Tories as Thatcher’s party. No wonder Cameron was up in Scotland last week trying to keep hold of North Sea oil. If that goes, then so does a large part of British prosperity and the Conservatives/ Thatcher’s image as the party of British prosperity.